If you’re lucky, you can buy some really good peaches at your local farmer's market, but, as is often the case, you can waste a lot of money at the supermarket buying peaches that rot from the center or are completely tasteless – two good reasons to grow your own! The selection of peach varieties is immense. Peaches can be white, yellow or red and there are different varieties to suit different climates. The newest developments enable warm winter growers to not only grow peaches, but to spread out their production from May to August! The Pride series from Zaiger is our offering for this particular climate. Start your harvest with May Pride, then Eva’s Pride, Mid Pride and then August Pride. These are all delicious, yellow freestone types. Clingstone peaches are great for canning, but in the modern world, few of us have the time for such activities. Hence, clingstone peaches have not been popular in the home orchard market. We do offer one clingstone variety, Indian Blood Cling, because it’s so unique! The skin is red and so is the rich flavored flesh. One of the newer phenomenons in the peach world is the “saucer” peach. The first variety we offered was Donut (also known as 'Stark’s Saturn'). This is a small, flat, white fleshed peach, slightly indented in the center, that has a hint of almond. (It’s interesting to note that peaches and almonds are closely related and grow on some of the same root stocks.) The next saucer variety we acquired was Sweet Bagel. This is a yellow fleshed peach with classic peach flavor. And last. but not least (it’s a very large peach! ), came Galaxy. This variety can weigh up to 1/3 pound. The light skin is accented with a red blush and the flesh is white, delicate and aromatic. Any fruit tree can lend beauty to the garden if it is pruned in a pleasing way, but many fruiting peaches have the additional bonus of spectacular flowers. Some prime examples are Double Jewel, May Pride, Red Baron and Saturn. You can also enjoy peach flowers without the fruit (see our selection in “Flowering Trees”). 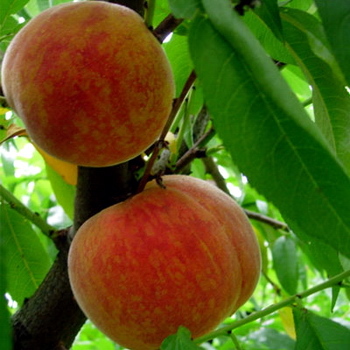 As with nectarines, peach trees are susceptible to the diseases peach leaf curl and brown rot of stone fruit. To help prevent them, do a good cleanup at the end of the season. If you live in an area where these diseases are common, spray copper sulfate two to three times during the dormant season. 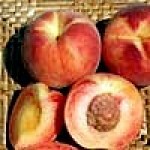 There are peach varieties that have been found to be resistant to peach leaf curl such as Frost and Indian Free. There are so many wonderful ways in which to use fresh peaches! They make a great morning treat on your cereal or over pancakes or waffles. Add a few drops of rum or kirsch over peaches for an ice cream topping, or better yet, make your own homemade peach ice cream! Don’t care for that fuzzy skin? simply submerge the peaches in boiling water for about one minute and the skin peels off in an instant. The history of the peach is somewhat surprising – the peach originated in China. It got its name from the Greeks on the false assumption that it was from Persia (the botanical name for peach is Persica). 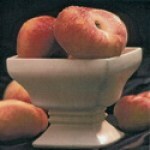 Peaches arrived in England in the middle of the sixteenth century. In 1629, seeds (or pits) were sent to the Massachusetts Bay Colony. Now peaches are grown throughout the United States with California, Georgia and South Carolina being the top producers. Nectarines are grown primarily in California and sold only as fresh produce, whereas peaches are also grown for canning purposes. Here’s an easy recipe for peach pie. Make a crust using canola oil: Blend 1 cup of flour with ½ teaspoon salt, ½ teaspoon sugar and 1/3 cup oil. Mix in 1 ½ tablespoons of milk. Form into a ball and refrigerate approximately ½ hour. Roll dough out between two sheets of plastic wrap. Mash 2 cups of peaches, add ¼ cup plus 2 tablespoons of sugar, ¼ cup plus 2 tablespoons of water and 1 ½ tablespoons of cornstarch. Mix 2 cups of raw peaches with 1 tablespoon lemon juice and place in unbaked pie shell. Pour the cooked peaches on top and bake in a 375 degree oven for 45 minutes. This same recipe can be used to make Strawberry Pie. NOTE: For areas with very hot, dry climates, we do not recommend Citation root stock. We have had reports from customers in Texas and Arizona who have had much better luck with Nemaguard. We realize some of the varieties are only offered on Citation and, if you wish to plant those varieties, be sure to supply adequate irrigation. Incredible, delicate flavored fruit! This white fleshed peach x plum can be eaten firm. It has a mild classic white peach flavor and finishes with a wonderful plum aftertaste that makes this fruit a unique treat. Early ripening in June. Superior quality canning clingstone. Cold hardy to zone 9 and probably 8. 4-500 hours. Self-fruitful. Available on Lov. Four of the following five varieties grafted onto one tree: May Pride, Mid-Pride, Eva's Pride, June Pride, August Pride. Available on Nemaguard. Popular yellow freestone peach on 5-6 ft. tree. Mild flavored fruit is large with sweet, low acid flesh and yellow skin with red blush. Ripens mid to late June in central Calif., earlier in low desert climates. Low chilling requirement, 250 hrs. or less. Good for desert areas. Self-fruitful. Available on: Nema. Delicious yellow freestone peach. More vigorous than other miniatures. Ripens in August, 2 weeks after Elberta. Late bloom with showy blossoms, is less susceptible to frost damage. 5-6 ft. tree. 500 hrs. or less. Self-fruitful. (Zaiger) Available on: Lov. Sweet, mild, low acid yellow freestone. Showy blossoms. Four to five feet tall. Ripens early to mid August. 500 hours or less. Self-fruitful. Available on Lov. Yellow freestone with sweet, rich peach flavor. Heavy bearing 5 foot tree. Excellent choice for home orchards. Ripens early to mid July. 400 hours or less. Self-fruitful. Pat. No. 5276 (Zaiger). Available on: Lov. Large, delicious, firm, yellow freestone peach with beautiful red over orange skin. Ripens mid to late June - two weeks before Honey Babe. Vigorous tree grows to 6 ft. 400 hrs. or less. Self-fruitful. Pat. No. 6364 (Zaiger). Available on: Lov. Large, round, white fleshed clingstone to semi-freestone peach with sweet, tangy, exquisite flavor. Two time taste test favorite. Very firm, perfect for slicing. Red over cream colored skin. Peak quality reached a short while after picking. Ripens in late July/early Aug. 700 hrs. Self-fruitful. (Zaiger) Available on Lov. Large, round, white fleshed clingstone to semi-freestone peach with sweet, tangy, exquisite flavor. Two time taste test favorite. Very firm, perfect for slicing. Red over cream colored skin. Peak quality reached a short while after picking. Ripens in late July/early Aug. 700 hrs. Self-fruitful. (Zaiger) Available on Cit. Large, all-purpose yellow freestone peach for mild winter climates. Has sweet, aromatic, rich flavor with tart skin; one of the very best. Ripens mid to late season, 3-4 weeks after Mid-Pride. Less than 300 hrs. Self-fruitful. (Zaiger) Available on Nema. Large, all-purpose yellow freestone peach for mild winter climates. Has sweet, aromatic, rich flavor with tart skin; one of the very best. Ripens mid to late season, 3-4 weeks after Mid-Pride. Less than 300 hrs. Self-fruitful. (Zaiger) Available on Cit. Longtime favorite white fleshed, freestone peach. Sweet and juicy, aromatic, subacid. Ripens mid July. Widely adapted: low chilling requirement, yet not early blooming. 250-300 hrs. Self-fruitful. Available on: Lov. Longtime favorite white fleshed, freestone peach. Sweet and juicy, aromatic, subacid. Ripens mid July. Widely adapted: low chilling requirement, yet not early blooming. 250-300 hrs. Self-fruitful. Available on Cit. Medium to large yellow freestone peach with red blush. Sweet, subacid, very flavorful. Proven variety for southern California, coast or inland. Ripens in late July. Chilling requirement less than 400 hrs. Self-fruitful. Available on Nema. Unique white fleshed, freestone peach with a sunken center - shaped like a doughnut. Sweet, with a mild, almond-like flavor. Ripens late June/early July. 2-300 hrs. Self-fruitful. Available on Nema. Unique white fleshed, freestone peach with a sunken center - shaped like a doughnut. Sweet, with a mild, almond-like flavor. Ripens late June/early July. 2-300 hrs. Self-fruitful. Available on Cit. Delicious low chill, very early peach with flavor and sweetness comparable to mid season varieties. Medium sized, has attractive red over yellow skin. Yellow flesh has very nice acid/sugar balance. Highly recommended for home orchards. Ripens early May in Central California. 500 hrs. or less. Self-fruitful. Pat. No. 9842 (Zaiger). Available on Nema. Delicious low chill, very early peach with flavor and sweetness comparable to mid season varieties. Medium sized, has attractive red over yellow skin. Yellow flesh has very nice acid/sugar balance. Highly recommended for home orchards. Ripens early May in Central California. 500 hrs. or less. Self-fruitful. Pat. No. 9842 (Zaiger). Available on Cit. Famous yellow freestone with classic, rich peach flavor; high scoring in taste tests. Use fresh, canned, cooked. Reported resistant to brown rot. Ripens late July/early August, up to 3-4 weeks later in colder climates. 600 hrs. Self-fruitful. Available on Lov. Famous yellow freestone with classic, rich peach flavor; high scoring in taste tests. Use fresh, canned, cooked. Reported resistant to brown rot. Ripens late July/early August, up to 3-4 weeks later in colder climates. 600 hrs. Self-fruitful. Available on Cit. Delicious, very low chill yellow freestone peach is medium to large, firm, with sweet flavor. Ripens late June/early July, midway between May Pride and Mid-Pride. 1-200 hrs. Self-fruitful. Pat. No. 7751 (Zaiger). Available on Nema. Delicious, very low chill yellow freestone peach is medium to large, firm, with sweet flavor. Ripens late June/early July, midway between May Pride and Mid-Pride. 1-200 hrs. Self-fruitful. Pat. No. 7751 (Zaiger). Available on Cit. Fine fruit for the very late season. Very large, yellow freestone peach, excellent flavor. Mid September in Central California. Early bloom. 4-500 hours. Self-fruitful. Available on Cit. Has beautiful, very showy, double pink blossoms and is late blooming. A bud sport of Fay Elberta and sweeter. Large yellow freestone is flavorful, firm, highest quality. All purpose - fresh/can/freeze/dry. Ripens early to mid August. 700 hrs. Self-fruitful. Available on Cit. From Florida, successfully grown in southern California and Arizona. Has larger fruit than Desert Gold and is more tolerant of desert heat. Firm, yellow meated cling to semi-freestone peach is very sweet and has very good quality when tree ripe. Good producer. Ripens in mid May in warm winter areas. 150 hours. Self-fruitful. Available on Nema. Has proven resistance to peach leaf curl (ten year trials at Washington State Univ.). Delicious yellow freestone with melting flesh and tangy peach flavor; yellow skin has slight red blush. Heavy bearing; excellent for canning and eating fresh. Harvest in July. Large, showy pink blossoms in spring. 700 hrs. Self-fruitful. Available on Lov. New "flat" or "saucer" peach considered to be a gourmet treat! The white flesh is sweet tasting with the pleasantly firm texture growers describe as "melting." The fruit is 3" across and weighs a hefty 1/3 lb - 25% larger and 50% heavier than the Donut peach. The skin is light cream accented with an attractive red blush and features the traditional delicate aroma of white fleshed peaches. It ripens in late June. Hardiness has not yet been tested outside of California, but growers are hoping it will perform well in other peach friendly climates such as Georgia and South Carolina. 450 chill hours. Available on Nema. Reliable, frost hardy, most cold hardy of the Elbertas. Yellow freestone peach with juicy, rich flavor and excellent quality. Ripens in July, ten days before Elberta. Fresh, can, freeze. Grown in Utah and Pacific Northwest. 800 hours. Self-fruitful. Available on Lov. Best early season yellow peach; with high taste test scores. Yellow meated semi-freestone with exceptional flavor. All-purpose; superb for fresh eating. Ripens mid to late June, but is not an early bloomer. 550 hrs. Self-fruitful. Available on Nema. Best early season yellow peach; with high taste test scores. Yellow meated semi-freestone with exceptional flavor. All-purpose; superb for fresh eating. Ripens mid to late June, but is not an early bloomer. 550 hrs. Self-fruitful. Available on Cit. Large, late season canning peach. Red skinned, red fleshed clingstone with rich flavor. Blooms late, sets heavy crops. Ripens in mid August. 800 hrs. Self-fruitful. Available on Lov. Large freestone with firm crimson and cream colored flesh. Tart until fully ripe, then has rich, sweet, distinctive flavor. Taste test winner. Highly resistant to peach leaf curl; good for wet spring areas where leaf curl is a problem. Ripens late August/early September. 700 hrs. Another nectarine or peach needed to pollenize. Available on Lov. Large freestone with firm crimson and cream colored flesh. Tart until fully ripe, then has rich, sweet, distinctive flavor. Taste test winner. Highly resistant to peach leaf curl; good for wet spring areas where leaf curl is a problem. Ripens late August/early September. 700 hrs. Another nectarine or peach needed to pollenize. Available on Cit. Juicy, reliably sweet, very flavorful yellow freestone peach for canning, freezing or fresh use. Produces reliable, heavy crops. Ripens mid to late July. 4-500 hrs. Self-fruitful. Available on Lov. Excellent, early, high quality peach for home orchards; perhaps the best flavored peach for its season. Intensely flavored, highly colored, yellow freestone. Ripens early July. 500 hrs. Self-fruitful. Pat. No. 6747 (Zaiger). Available on Nema. Favored late summer peach at Dave Wilson Nursery. Delicious true peach flavor with a good balance of sweetness and acidity. Fruit is large and the tree is extremely prolific. Good for fresh eating as well as canning and baking. Ripens in August. Self-fruitful. Recent low chill trials show Kaweah to be productive at 500 hours or less. Available on Lov. Superb, large, low acid yellow freestone peach with excellent flavor and texture; recent taste-test winner. Requires little or no thinning. Late blooming. Ripens over 2-3 week period beginning in mid to late July. Excellent for home orchards. 750 hrs. Self-fruitful. Available on Lov. Very early ripening peach for warm winter climates with delicious, sweet, tangy, yellow semi-freestone fruit. Ripens in late May/early June; very large for such an early peach. Large, showy pink blossoms. 150-200 hrs. Self-fruitful. Pat. No. 7775 (Zaiger). Available on Nema. Very early ripening peach for warm winter climates with delicious, sweet, tangy, yellow semi-freestone fruit. Ripens in late May/early June; very large for such an early peach. Large, showy pink blossoms. 150-200 hrs. Self-fruitful. Pat. No. 7775 (Zaiger). Available on Cit. Best yellow freestone peach for warm winter climates of southern California, Phoenix, Houston, San Francisco Bay area. Also recommended for central California for its exceptional flavor and dessert quality. Ripens mid season (July in central California). 250 hrs. Self-fruitful. (Zaiger) Available on Nema. Best yellow freestone peach for warm winter climates of southern California, Phoenix, Houston, San Francisco Bay area. Also recommended for central California for its exceptional flavor and dessert quality. Ripens mid season (July in central California). 250 hrs. Self-fruitful. (Zaiger) Available on Cit. Popular fresh market yellow freestone peach now available for home planting. Large, firm, with red skin and superb flavor; good for freezing. Strong, vigorous, heavy bearing tree. Ripens mid to late August. 750 hrs. Self-fruitful. Available on Lov. Heavy fruit set even at an early age. Medium to large, very freestone yellow fruit with great flavor. Skin is 90% red over yellow. Showy spring bloom. Parent tree sits right next to the sand in Shell Beach, California. Only suitable for very mild winter areas. Ripens in early July over two or three weeks. Self-fruitful. 150-200 hours. Available on Nema. Large, favorite, late yellow freestone peach with sweet, rich flavor, like J.H. Hale. Use fresh/freeze. Small tree with showy bloom; late blooming. Ripens in mid August. 800 hrs. Self-fruitful. Available on Lov. Large, favorite, late yellow freestone peach with sweet, rich flavor, like J.H. Hale. Use fresh/freeze. Small tree with showy bloom; late blooming. Ripens in mid August. 800 hrs. Self-fruitful. Available on Cit. Large yellow freestone with fine, melting flesh that combines delightful sweetness with excellent peach flavor. Pointed in shape, yellow skin with red blush. Possibly the best tasting peach for most home orchards. Ripens early to mid July. 200 hours. Self-fruitful. Available on Nema. Large yellow freestone with fine, melting flesh that combines delightful sweetness with excellent peach flavor. Pointed in shape, yellow skin with red blush. Possibly the best tasting peach for most home orchards. Ripens early to mid July. 200 hours. Self-fruitful. Available on Cit. A new donut peach from Zaiger, this one has beautiful white flesh with red marbling. The clingstone fruit is medium sized with wonderful flavor that will keep you wanting more. Ripens mid to late May, 450 hours or less. Self-fruitful. Taste test winner. One of the all-time highest scoring varieties in blind fruit tastings at Dave Wilson Nursery. Low acid, high sugar, white fleshed peach with tantalizing flavor. Large freestone, very firm when fully ripe, with attractive red skin. Harvest early to mid July in Central California. Estimated chilling requirement 750-800 hrs. Self-fruitful. Pat. No. 10175 (Zaiger). Available on Lov. Longtime favorite white freestone peach for California. Very sweet, aromatic, juicy with superb, delicate flavor. Ripens late June/early July. 4-500 hrs. Self-fruitful. Available on Lov. Longtime favorite white freestone peach for California. Very sweet, aromatic, juicy with superb, delicate flavor. Ripens late June/early July. 4-500 hrs. Self-fruitful. Available on Cit. Fine, large, sweet, flavorful, late season yellow freestone peach. Ripens late; early September after Rio Oso Gem. Used fresh, canned and for freezing. 700 hrs. Self-fruitful. Available on Lov. The peach variety immortalized by David Masumoto in Epitaph for a Peach. A favorite fresh market variety, has good flavor while still firm enough to ship. Large, very firm, fine flavored yellow freestone with bright red skin over yellow. Frost hardy blossoms, consistent producer. Tree-ripe harvest in late July. Originated in Fresno, California. 500 hrs. Self-fruitful. Available on Lov. Flat "donut" shaped peach with yellow flesh and classic peach flavor. Has large fruit and sets heavily in California's Central Valley. 300-400 hours. Self-fruitful. Available on Nema. Delicious white freestone peach for mild winter areas. Fruit is medium sized, with creamy white, firm, aromatic flesh with balanced acid and sugar and superb flavor. Showy blossoms. Harvest begins mid June. Very low winter chilling requirement, about 200 hrs. Self-fruitful. Available on Nema. Delicious white freestone peach for mild winter areas. Fruit is medium sized, with creamy white, firm, aromatic flesh with balanced acid and sugar and superb flavor. Showy blossoms. Harvest begins mid June. Very low winter chilling requirement, about 200 hrs. Self-fruitful. Available on Cit. Among the best of the low acid, high sugar, fresh market white fleshed peaches. Red skinned fruits are medium to large, very firm, freestone. Has the best track record of any of the Zaiger white fleshed peaches for producing well in a variety of climates, including the eastern U.S. Ripens mid July in central California, about one week ahead of Sugar Lady. 800 hrs. Self-fruitful. Pat. No. 5821 (Zaiger). Available on Lov.